Yacht pre-purchase surveys differ enormously, depending on the surveyor involved. No matter how knowledgeable or experienced a surveyor is, he or she will only find a vessel’s issues if they spend adequate time looking. If your yacht broker is recommending a surveyor who will take a day to inspect a 50-foot motor yacht and then produce a 12-page report, you’re being short-changed. As independent surveyors, we strive to be fair to all parties. We also pride ourselves on our thoroughness, and this is why we allocate more time for a yacht inspection than many other surveyors. When you’re comparing prices, bear in mind that not all surveys meet professional standards. If you have doubts, ask for a sample report. Our standard pre-purchase survey includes a comprehensive assessment of the boat afloat, as well as out of the water on the hard. It also covers a thorough visual inspection of engines. We always recommend a sea trial, as many issues only show up underway. 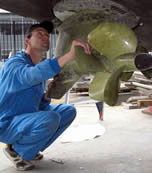 In addition to the standard survey components, we offer engine oil and gear oil sampling (for testing via an independent laboratory); yacht tender inspection/trialling; and upper rig inspections for sailboats. On occasion, we’ve been asked to conduct an in-water (only) pre-purchase survey. While we’re flexible on inspection arrangements and more than happy to customise a survey to a client’s needs, we highly recommend a short out-of-water inspection before purchasing a yacht of any description. We regard an in-water-only appraisal as a partial condition survey. 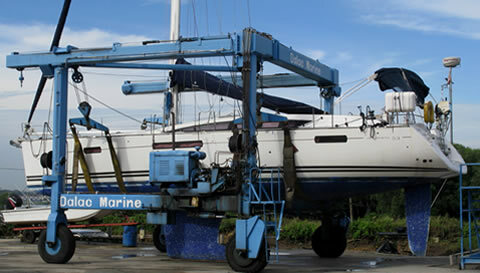 When a yacht is lifted out of the water and pressure-washed for inspection purposes, the surveyor can view it wet or dry, sight the hull from different angles, use a variety of testing methods and equipment to identify and confirm issues, percussion-sound the hull for voids and delamination, measure wear in running gear, and check propellers for blade distortion. Because out-of-water inspection is such a valuable and informative part of the survey process, we don’t usually offer dive inspections to pre-purchase customers. In most cases, dive inspections give limited value for the cost incurred. However, if there is no choice and only dive inspection is possible, our senior surveyor personally performs the dive, rather than relying on a third party with video equipment. 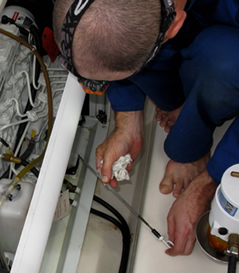 Ideally the sea trial inspection is carried out with a very clean hull and running gear – especially on motor yachts. Full assessment of engine performance is impossible if the hull is heavily-fouled. Marine growth is particularly rampant in Singapore and SE Asia, so we recommend either scheduling the sea trial after the survey lift, or arranging for a diver to thoroughly clean the hull and running gear one or two days prior to the inspection. Our detailed reports include photos and recommendations. If you were unable to attend the survey, we recommend a phone discussion the day after the inspection is completed, in advance of the formal report. Of course, not all survey findings are relevant to the purchase process. Wherever possible, we try to include items that will help you with maintenance and upgrades during your ownership. Once you’ve had a chance to read the report, we are happy to talk you through any issues raised.